Almost 600 Samford University students spent a busy Saturday morning giving back to the community on April 18. They cleaned buildings, sorted clothes, lay straw, painted--walls and children’s faces--and undertook a multitude of other chores. In short, they tackled whatever needed doing at 31 work sites. 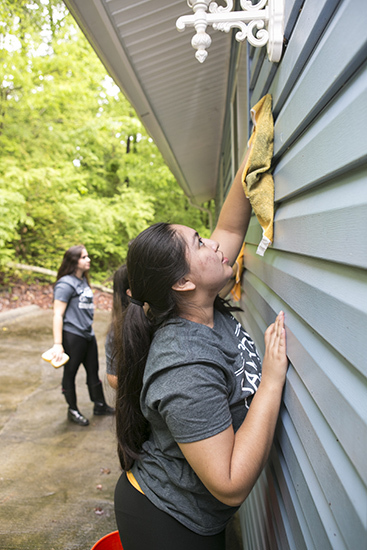 It was Samford Gives Back Day, the annual campus-wide initiative that gives students an opportunity to help a variety of local agencies and organizations. In the process, they learned about the Birmingham area and its needs, and many ended the day with new friendships and insights about themselves. Groups included sororities, fraternities, academic societies, service organizations and individuals who formed teams. Agencies and organizations benefiting from their help ranged from the Alabama Kidney Foundation, which held its annual 5K fundraiser on the Samford Track, to the Birmingham Zoo. Workers helped at a Habitat for Humanity build site and assisted with Samford’s Old Howard 100 bike ride that raises support for projects in Perry County. Many volunteers expressed sincere reasons for giving a Saturday morning in the name of service. Bailey Lang, a McWhorter School of Pharmacy student, was coordinator of the Students for Life/Catholic Student Association group at the Lovelady Center for women. There, the group helped with child care and cleaned a storage room in order to create a new donation call center. “Samford Gives Back is important because although we are here for a short time, this [Samford] is our home for four years. It is important to give back to our community,” said Lang, who is from Louisville, Kentucky. Maggie McGahren and Olivia Donahue, both freshmen from Brentwood, Tennessee, were part of Lang’s team. Donahue, an art major, had worked at the Lovelady Center earlier this year and was eager to help there again. She also knew it would be fun. McGahren, an education major, echoed the sentiment. “It’s great for freshmen because you can get involved with different groups,” she said. Katie Nelson, a junior nursing major from Woodstock, Georgia, also appreciated the chance to make new friends while working with Samford’s International Club at Eastern Area Christian Ministries. Her group helped the community ministry sort winter clothing and replace the inventory with summer items. Eden Long, a sophomore journalism and mass communication major from Costa Rica, led 10 women who volunteered at the Family Life Center in the East Lake. Her “Delight Ministries” group, making its debut as a Samford Gives Back participant, spent the morning cleaning the worship center. Margaret Mason was a part of the All in for Alzheimer’s group that volunteered at South Haven Health and Rehab facility. “Samford has given so much to students that we, in return, need to give back to the community. These are some of the most impactful times of our lives, and we need to give back to others,” said Mason, a sophomore English major from Columbus, Georgia. Some groups found ways to match their skill sets and interests with specific needs at work sites. At Girls Incorporated of Central Alabama, the Samford Dietetic Association helped plant a garden that will produce crops for a community nutrition education program. A group of freshmen found a way to satisfy their desire to do something that was related to animals, said team leader Tayler McPherson. “Doing arts and crafts at the Birmingham Zoo was a fun way to give back to the community,” said McPherson, a health professions major from Norcross, Georgia. Carter Jackson, who along with Bri Holt, served as a student coordinator for Samford Gives Back, hopes the Samford Gives Back experience helps the students to want to continue to serve. Jackson is a sophomore journalism and mass communication major from Lake City, Florida. Holt is a junior exercise science major from Hueytown, Alabama. Samford Gives Back is organized by the university’s Office of Student Leadership and Community Engagement and Omicron Delta Kappa national leadership society. Note: Samford student news writers Bailey Fuqua and Jimmy Lichtenwalter contributed significantly to this story.